Making s'mores is an easy and fun task to do as a family while you are sitting around watching the campfire. Many parents pass along this nostalgic ritual because they remember it from their childhood. 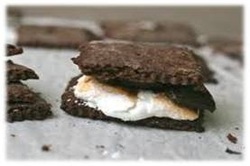 This recipe puts a little spin on your traditional camping s'mores recipe by incorporating chocolate graham crackers for those chocolate lovers out there. Also, the mini chocolate variety pack that includes Krackel, Mr. Goodbar, Milk and Dark Chocolate candies is the perfect addition to add to your shopping list for making s'mores. If you ask anyone that has done it before, the key to making the perfect s'more really boils down to cooking the perfect marshmallow. We recommend purchasing a long marshmallow roasting stick so you can position your marshmallow right where you want it. Some people like their marshmallow golden brown and others like it all the way burnt with a black crust. The golden brown variety obviously takes a little more patience and skill, but if you hold your marshmallow ove the coals instead of the direct flame at the right distance, you are well on your way to making the perfect campfire s'more. Once you have your s'more cooked to your liking, it is time for some assembly. Put your chocolate graham cracker on the bottom followed by your favorite mini chocolate and then cover it with your cooked s'more. Finally, top it off with another graham cracker to create a sandwich and that's it! You are now ready to enjoy a tasty treat that will be passed down for generations to come.